Sri Vekateswara temple in the Tirupati is world famous holy place; it attracts devotees from all over the world. In order to provide better governance and to offers better service to the devotees “Sri Venkateswara Anna prasadam trust” was started in the year 1984 itself. Few decades ago the amount collected as the devotees yields the interest amount of few lakh in numbers however, in recent days especially after the hit of demonization people from all over the nation particularly from the southern region have donated a lot. Owing to the results, the corpus amount collected in the Tirupati Venkateswara temple goes to the high of Rs. 800 Crore. With such high amount deposited under the TTD bank accounts the trust able to provide free meal to more than a lakh pilgrim who visits the holy hill temple. According to the bank official who pointed that the interest amount collected from the respective bank accounts of TTD reaches Rs. 60 Cr. From the collected yearly interest amount, the TTD is about to contribute Rs. 25 Cr on yearly basis for providing free meals to the pilgrims from all over the world daily. The free meals scheme was firstly introduced by the former CM of AP state Mr. N T Rama Rao who is also the responsible person for forming the Annadanam Trust in the cash rich holy Hill temple. 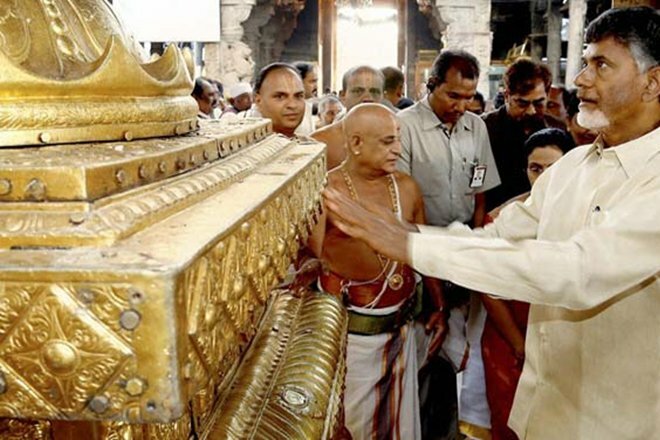 As per the data released by the TTD officials, the temple management under the scheme of Gold Monetisation scheme had deposited over 950 Kg of gold in the SBI bank. Officials also quoted that the trust have decided to renew the gold deposits in SBI which done in 2 years ago. The trust was formed nearly 3 decades before and it was formed at a small scale during the initial days by the former chief minister of Andhra Pradesh Late NT Rama Rao. Under this trust the temple management provides free prasadam to every devotee earlier. As the temple management gains lots of money as donations from the devotees, the management decided to provide free meals to all devotees every day. According to the recent reports released by the Sri Venkateswara Anna prasadam trust in its official web sites, nearly more than 2 Lakh devotees from all over the world has been offered full means at free of cost by the trust every day. The trust also delivers free food packets to the devotees who are standing in queues to darshan the lord venkateswara. The entire trust is completely operational under the donations made by the devotees or donors from the pilgrims all over the world. The Tirupati Devasthanam deposits all the donated amounts into bank account of nationalized banks. From the interest amount gained by deposits made by the TTD (Tirumala Tirupati Devasthanams) in banks, the trust manages to provide free meals to the devotees daily.